Quantity Per Pack: Depend on size. Owing to our state-of-art manufacturing unit, we are able to manufacture and supply a comprehensive range of Brass Square Moulding Nut. We are successfully meeting the requirements of our clients by manufacturing the best quality range of Brass Moulding Nut. 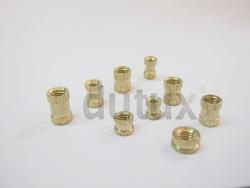 We are leading manufacturer of Brass Moulding Nut having best quality. For more details, feel free to contact us. Minimum Order of Quantity : 5000 Pieces. To cater the variegated needs of our esteemed customers, we are highly engaged in offering a wide array of Brass Molding Nut. With rich industry experience and knowledge, we are providing an excellent quality range of Brass Molded Nut. Approx 500 Rs to 600 Rs per kilogram as per quality and size. To cater the variegated demands of our esteemed clients, we are highly engrossed in providing a wide range of Brass Moulding Nut. Our offered nuts are precisely manufactured using supreme quality brass at our manufacturing unit. In order to serve various clients’ demands, these nuts are offered in varied specifications.